This photograph by Lewis Hine was taken in a New York City tenement in 1910. Hine was a documentary photographer who frequently turned his lens to the plight of immigrants, workers, and the poor. 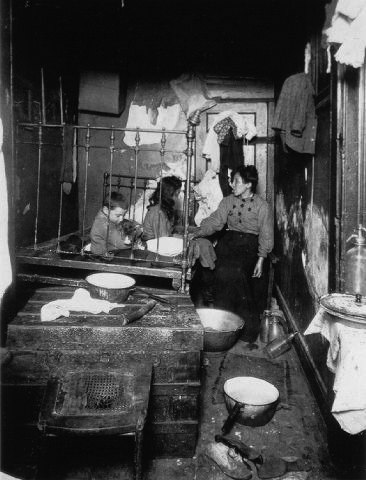 This family group, perhaps among the approximately two and a half million Italians who arrived in New York in the years 1890-1910, lives in squalid and cramped conditions typical of New York tenement buildings at the turn of the century. Source | Lewis W. Hine, "Tenement, New York City, 1910," black and white photograph, 1910; in Walter Rosenblum et al., America & Lewis W. Hine: Photographs 1904-1940 (New York: The Brooklyn Museum with Aperture, 1977). Cite This document | Lewis W. Hine, “"Tenement, New York City, 1910",” HERB: Resources for Teachers, accessed April 18, 2019, https://herb.ashp.cuny.edu/items/show/1044.